We are at week four of potty training! Little Man is completely trained…dare I say that? I mean, he tells me when he needs to go, goes both #1 and #2 in the potty, and can go on outings and stay dry and or use the potty out, as well as go through nap and night-time completely dry…scarily and completely surprisingly to say, I believe our Little Man is officially Potty Trained! No glory to us as parents or to our son as a ‘good boy’, honestly and truly, it was and is all by the grace, mercy, and generosity of God. Which brings us to my desire to record a top list of things that worked for us in a place that I know will not get lost…which happens to be our blog. So if you don’t have children and this bores you, skip it. If you do have children and you think I have no idea what I am talking about, you are right and you could skip it too. If you want to have a good laugh, read on. 1. 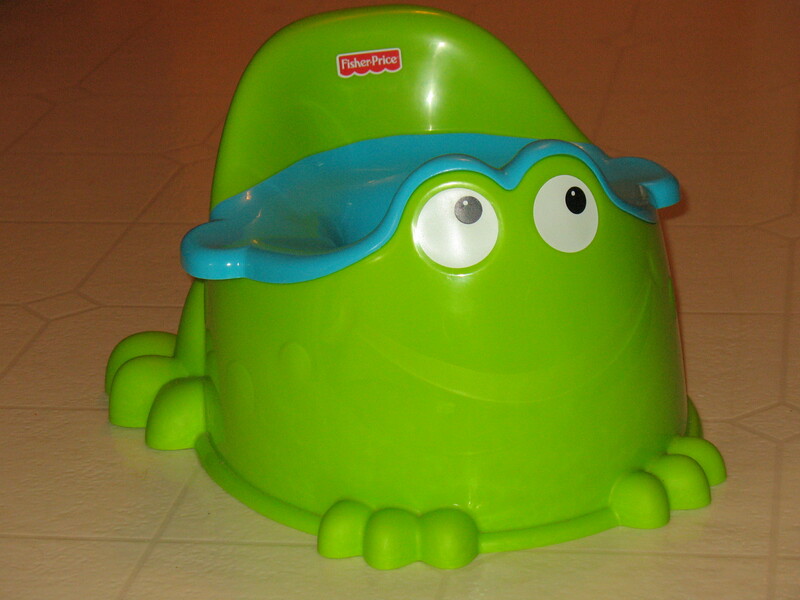 Buy a little potty: We bought Little Man a potty around 18 months when he started showing signs that he knew when he was going in his diaper. We bought this ‘froggy potty’. It works great for little boys, which we found out after 1st purchasing a different one not all ‘boy’ potty’s actually do work well for actual little boys. 2. Start a small habit of sitting on the potty once a day when you think they might go. For Little Man this was always at night before bath time. 3. Talk about the potty. Talk about what is happening as he is using it and whats expected. 4. Praise! When he did actually go in the potty we went crazy in excitement, helping him to know it was a good, big deal when he did go. 5. Pray. No joke, I prayed about this a TON. Prayed that God would help me to know when to try, that God would prepare Little Man to be ready and for him to be able to communicate enough to understand my expectations and be able to communicate back his thoughts/apprehensions. Also we would pray with Little Man about this together, like at night before he went to bed, that God would prepare Mommy and Daddy and Little Man for this transition, etc. 6. Talk. As the time got closer, I began talking to him about the potty during most diaper changes, about how soon we would “Get to!” go potty in the big potty and how we would be all done with diapers. 7. Observe. I tried to observe when Little Man would use his diaper, especially #2. Then I could know about when he would potentially go and could talk to him and prep him for it. 8. Plan ahead to be all in! I wanted to be completely available for at least a week when I attempted potty training for the 1st time because a) I didn’t and still don’t have any idea what I am doing and 2) I knew that it wouldn’t happen in a day. So I wanted to have at least a week with no separations or out of home environment outings so I could continue on with potty training for several days straight. That is why I crazily chose the week of Thanksgiving because there were no distractions or outings other than time at his grandparents home where I could still keep a constant eye on him. 9. Be ready. I wanted to start first thing in the morning as soon as he woke up and go straight from there. 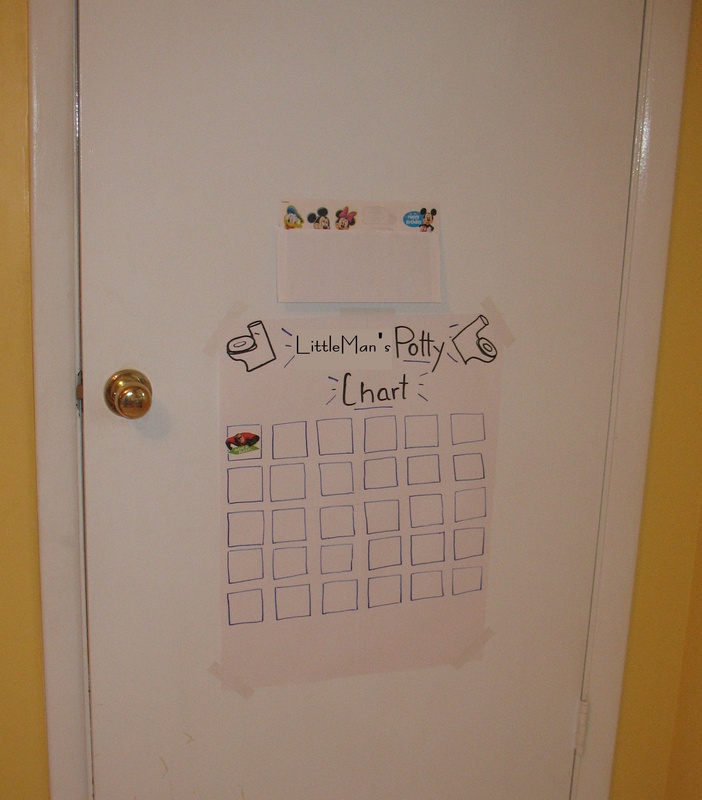 This meant having his potty upstairs in the bathroom ready, having all materials ready, wipes, underwear washed and ready to be worn (we went straight to underpants), any encouraging stuff, like a sticker chart or a basket of special books to read, etc. 11. Change it up if need be. I quickly realized that some sort of reward system would potentially work well with our little guy but I didn’t want it to be food related since I knew it could too easily become a long stretching habit (like a cookie every time you potty could add up to 10 cookies a day very rapidly once he caught on). So I made up a sticker chart during his nap time with his name and a bunch of little boxes. Every time he went potty he got to choose a sticker and put it in a box. He LOVED this! 12. Stick with it. At the end of the first day I was so flippin’ tired. Between exuberant joy, constant attention and cleaning up messes, potty training a toddler can be exhausting! But I stuck with it, and day 2 was very similar to day one. I was tempted to give in. But I didn’t. And you know what? Day 3 was his first day he stayed dry all day and he’s been dry every day since then (with literally only 2 separate mini accidents). For any of our future little ones I realize this could take 1 day or 10 days, but I really believe that consistency was key for our Little Man. 13. Mostly, have fun. This was such a sweet time for Little Man and I. I told Hubby that it was so great for our Mommy, son relationship. I got SO many opportunities to encourage him, praise him, and tell him how thankful for him I am. We got to spend whole days just reading together, talking, painting, drawing, and playing while we waited for ‘mother nature’ to do her thing. I got to model grace during the many failed attempts and got to instruct with patience and love as to how to help it to go well the next time. I really feel like we have benefited from this whole experience! And I think that is it. Whew…what a whirl wind that first week was. What an unexplainable joy it is to have children! Who would have known that potty training toddlers could be an opportunity to praise God for His goodness? Be prepared by having a plan. Be willing to hold that plan loosely. Plan for messes to be made. Plan to spend lots of sweet uninterrupted time with my toddler, for future children this may even entail hiring a sitter for a few days…who knows! Are any of you potty training? If you have older children, what are your top tips or words of encouragement to parents who are in the midst of or are preparing to potty train? I am ALL ears! You have done wonders. It’s unbelievable at not even 2 1/2 years old. You both are such great parents! I gotta tell you the truth… we really aren’t… ha! For real, I have no explanations for this that aren’t supernatural. We are, however, very thankful though!